It is important to understand how your location has the ability to dictate the size of your garage before you begin to come up with a plan that includes additions to property. It may be beneficial to look into the common mistakes that can occur while building a garage before you begin the process. In order to avoid making a mistake, come up with a plan that coincides with your city’s sizing regulations. Consider building a garage that is big enough to fit your vehicles. It would be unfortunate to get halfway through your garage creation, only to discover that your design was too small to fit your cars and your storage items. For a single-car garage, an average size to go by is at least 14 by 20 feet. For a two-car garage, the measurements are typically around 20 by 24 feet. A good first step is to decide whether it’s physically feasible to fit a garage in the area in which you would like to build one. 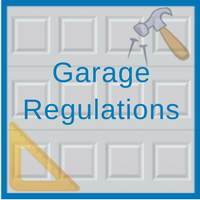 You may wish to ask your neighbors if there are any special restrictions that apply to garages in your area, as some communities require certain sizes. Local Chicago builders are usually informed with these up-to-date garage size requirements as well. You will need to have a building permit in order to build a garage that includes additions or modifications to your living space. Make sure that this is done properly with the help of a team member at Blue Sky Builders. We are able to take care of this part of the garage-building process for you. It is important to understand the zoning restrictions in your city because they help establish the legally permitted use of a property. The rules for zoning vary depending on how you wish to re-design your garage. If you are considering building a new garage or redesigning an existing garage, and need help with figuring out how your city may dictate the size, contact our garage experts at Blue Sky Builders today. Visit us online at http://www.blueskybuilders.com or call us today at 630-852-8485 for more information. Our Chicagoland area garage specialists can provide assistance to our clients with their garage maintenance needs.